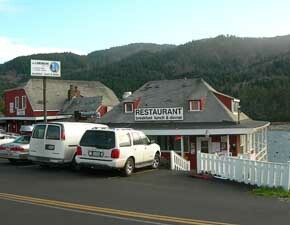 "Best Family Restaurant on the Oregon Coast"
"I never met a better view." FEW PLACES in the United States compare with The Landmark -- sitting on the rocks in Yachats on the Oregon coast, with unobstructed views of the estuary where the Yachats River meets the Pacific Ocean. This is a place where the locals use the catch phrase "just another day in paradise" and mean it. Quiet and friendly, Yachats (pop. 675) is 150 miles from Portland and a two-hour drive from Eugene or Corvallis. It is 30 minutes from the expanding retirement community of Florence and 25 minutes from the fishing town of Newport. 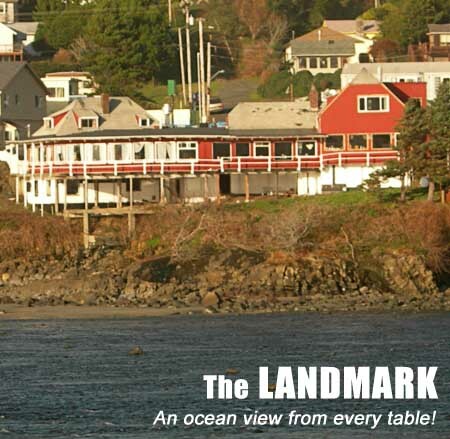 The Landmark features award winning food and live music in this breathtaking, comfortable setting. Our food centers on the fresh fish of the region. Crab, salmon, bay shrimp, halibut, and cod are just some of the delicate, healthy, lightly-prepared item on our menu. Our fish & chips bring the authentic Oregon coast to your table. Then there is the Italian side of the menu, a world like none other in the area. Our Italian recipes are from southern Italy via Long Island, N.Y., presenting the simple taste of old world Italy; a marinara sauce that allows the full flavor of the tomatoes to shine through, homemade baked ziti, fresh meatballs, the classic flavors of olive oil and garlic right here on the Oregon coast. In the Landmark Lounge, our live music presents diverse, talented musicians in a setting that allows for intimacy and still has enough room to let it rip. Our crowds (75 capacity) have been known to pack the dance floor, cheering the bands. 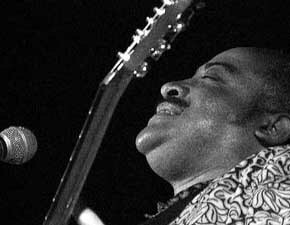 Be it blues, rock or reggae, the music is always high-quality and professional. THE SPOT is a natural, located where the river meets the sea. Through the picture windows, the customers eat and drink watching seals bob in the high tides of winter, seeing the kids fly kites on the sandy beach of summer, watching the salmon struggle upriver in the spring, gazing on the magnificent sunsets year round. A restaurant has been on this spot since 1911, first as a cookhouse for a small band of settlers, then as a tiny cafe sitting beside the dirt road that ended at the river a quarter of a mile south. Highway 101 was completed in 1934 and a woman from Portland, the industrious and effusive Beulah Swigert, took over the place, naming it the Sea View Inn and building a reputation for home cooking that drew national attention. It was a small place then, just a half dozen tables and a coffee bar. But a smiling Beulah and a loyal staff made the little place glow. Beulah died in 1959 (but many say she hasn't left the building) and the Sea View changed hands twice before two men from Portland, Richard Heath and Larry Zimmerman, took over in 1968. They expanded into the neighboring auto parts store (now the back room of the bar with the stage and pool table). Renamed Beulah's Sea View Inn and the On the Rocks Lounge, it featured fine dining and national entertainment. Acts like the Ink Spots, the Coasters and the Drifters played the lounge and as Yachats grew so did the reputation of the former cookhouse. In 1989 the place changed hands again, purchased by absentee owners and named The Landmark. It changed hands again in April 2002, returning to local ownership and is now run by Yachatians (pronounced Ya-hay-chuns) dedicated to providing the kind of food and service that made the place an institution. Less than one-half of one percent of the world's coastline is on estuary frontage such as ours. 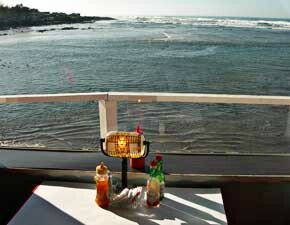 We are the kind of place, very old Oregon, very hip, that perfectly suits the style and tastes of Yachats and the coast. We attract a youthful crowd from Lincoln County and from Eugene, Corvallis and Portland looking for something fresh and exciting. We are a very comfortable place for families and large groups. Our dining room is flexible enough to accommodate just about any combination. We have a menu that appeals to retirees as well, prices are affordable for just about any budget. Come and join us! The Landmark opens at 8 a.m. every day. © Copyright 2006 - 2016 The Landmark. All rights reserved. 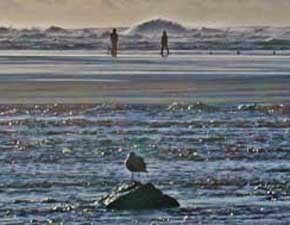 Meaning of "Yachats": There are many theories about the meaning of Yachats. Most mispronounced word: Yachats, which is actually pronounced YA-hots. 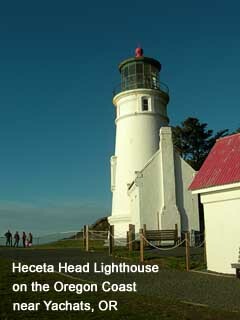 Second most mispronounced word: Heceta, as in nearby Heceta Head Lighthouse, Heceta Head, etc., which is actually pronounced "Ha - SEE - Ta." Town slogan: "We're all here because we're not all there." Corollary slogan: "Everybody has to be somewhere." Real estate slogan: "Any further west and you're wet." Population: 675 people in the year 2000. 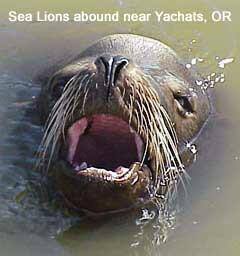 Sea lion population: very high -- the World Famous Sea Lion Caves are just a few minute's drive south of Yachats. Seagull population: also very high. 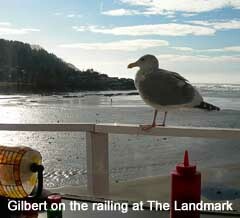 The seagull frequently seen on the railing at The Landmark is named "Gilbert." Physical Size: According to the United States Census Bureau, the City of Yachats has a total area of 0.9 sq. mi. Location: Yachats is located at 44.3 degrees North, 124.1 degrees West (latitude/longitude).. Distance to the beach: You're there! 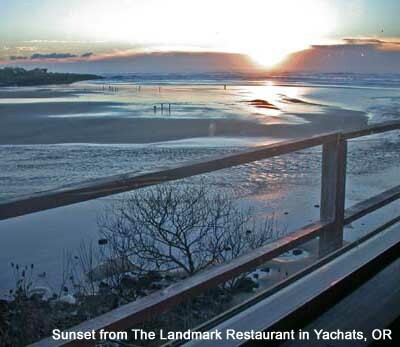 Distance from The Landmark: In Yachats, you are never more than a few minutes from The Landmark's great food, its live music and stunning view. Number of parks: Yachats boasts two state parks, a city park and a municipal commons. Highest point: Cape Perpetua, located a few miles south of Yachats, is the highest point on the Oregon Coast. Giant spruce: South of Yachats there is a Sitka spruce judged to be at least 565 years old. This tree goes up over 185 feet and is 40 feet round at the base. 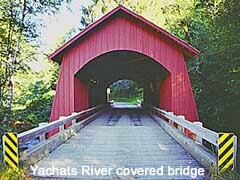 Covered bridge: America's western-most covered bridge is located near Yachats on the Yachats River. 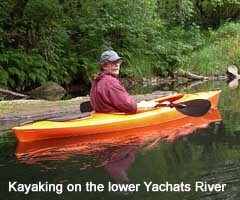 Preferred method of transporation: And speaking of the Yachats River, the preferred method of transportation on the river is kayak or canoe. Median house value: above the Oregon state average. Percentage of population with a college degree: above the Oregon state average. Note:We will be closed to the public on November 3rd due to the Maid Complete San Francisco retreat. PLEASE NOTE: This is an information-only web site. We do not collect, retrieve or restore any information from this site.